If you like reading my blog, chances are high that you're somewhat familiar with Japan in general, and the magic of Japanese Kit Kats is nothing new to you. 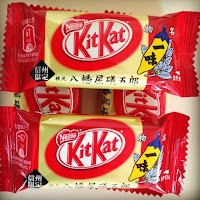 Still, I've personally never written about Japanese Kit Kats before, and it wouldn't be right of me to go on blogging without paying homage to these favorite treats of mine. 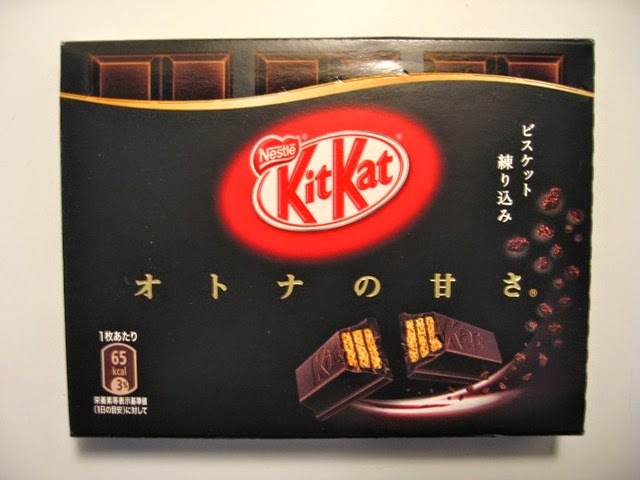 Most everyone has eaten, or regularly eats the familiar milk chocolate and white chocolate Kit Kats that are available worldwide. Most everyone also knows that Kit Kat was created by the Swiss company Nestlé. 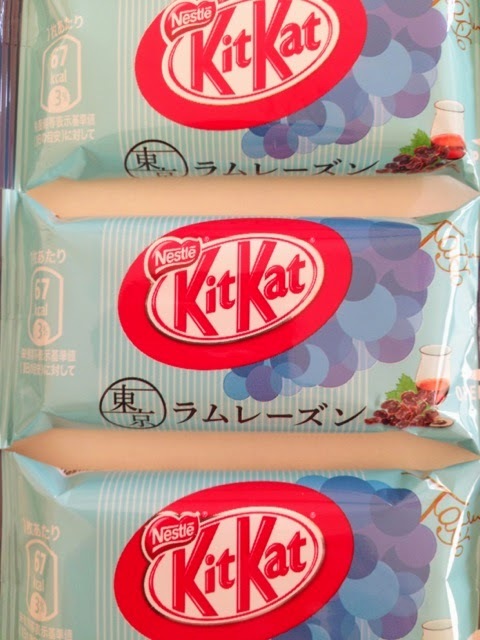 Nestlé Japan, however, seems to have some sort of special arrangement in place since the Kit Kats here come in a huge variety. 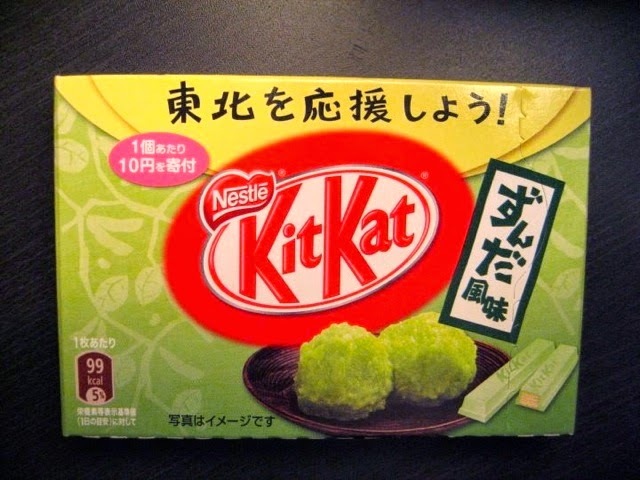 Flavors like "matcha" (powdered green tea) are already famous globally, and are one of the top-selling souvenirs purchased by visitors from overseas. 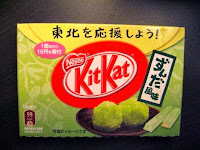 The green tea variety is already quite mundane here in Japan, however, where the flavours vary by season and by region. Japanese cuisine is very seasonal by nature, so the local Kit Kats follow suit. 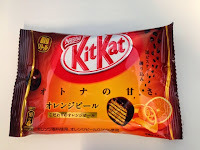 Some of the flavours I've enjoyed recently include Passionfruit (summer), Almond (autumn), Cayenne Pepper (autumn), Rum Raisin (winter), and two recent offerings-- Orange Peel (spring) and Toaster Kit Kats (spring) which you brown in a toaster oven! 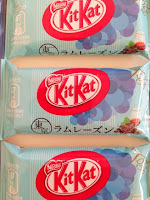 Most of these flavours are available nationwide, except for Rum Raisin which is (was) available only in Tokyo. In my humble opinion, however, the Pièce de résistance is the very newest Kit Kat flavour shown in the cover photo of this post. 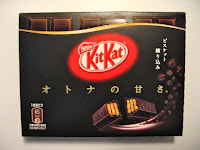 This is the latest edition to the "Sweetness for Adult Tastes" (オトナの甘さ) series-- Raspberry. Raspberry sounds rather plain in comparison to some of the other flavours I mentioned, but this one is so delicious it's shocking. It does not taste like Raspberry candy at all. It tastes more like fresh Raspberry Mousse. Looking closely at the product, it's obviously that there are actually bits of puréed raspberry in the chocolate. 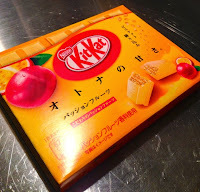 The flavour is incredible and to me is the tastiest fruit-flavoured Kit Kat I've eaten up until now. "Where can I buy these?" you may ask. Actually, one of the most reliable places to get them is at duty free shops such as "Tax Free Akihabara" in Narita Airport. Another fool-proof location is the Tokyo Miyage Center (東京みやげセンター) on the lower level of the Tokyo Station shopping area near the Yaesu Entrance. 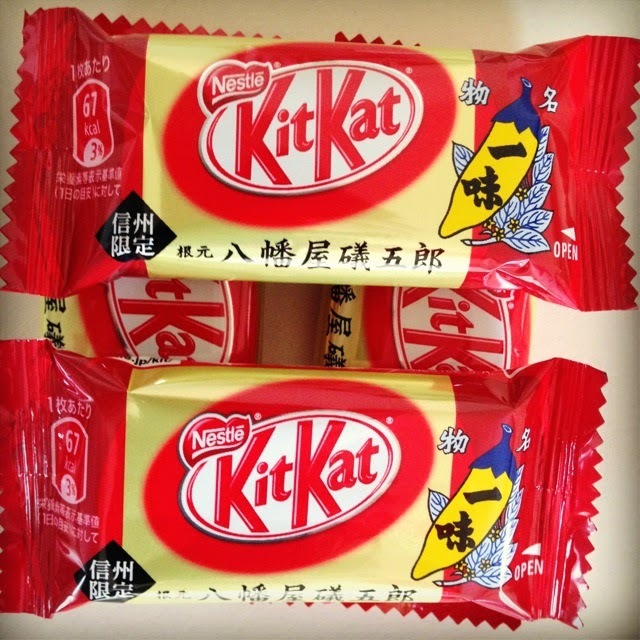 Years ago, special edition Kit Kats were available at almost every convenience store. For some reason, however, convenience stores nowadays rarely have anything other than plain milk chocolate. 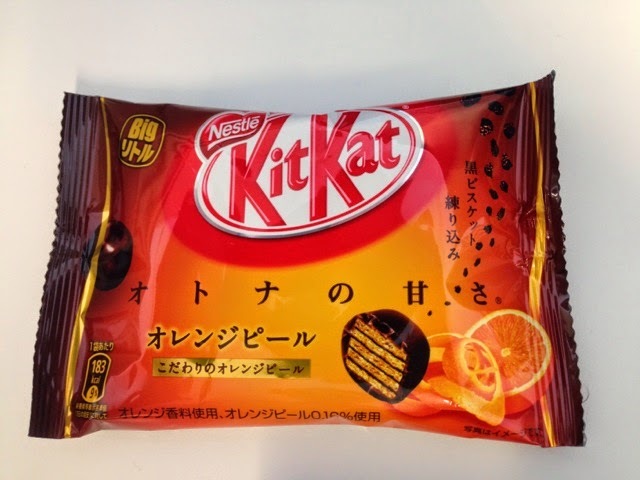 Early this year Nestlé took things to the next level by opening a specialty shop in the Ikebukuro (池袋) location of the Seibu Department Store. 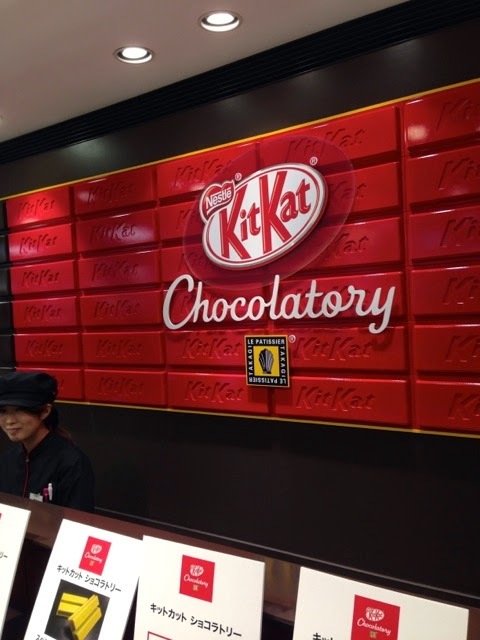 It's called the Kit Kat Chocolatory. At this shop chocolate-makers sell exclusive and very limited batch Kit Kats that they make by hand every day! 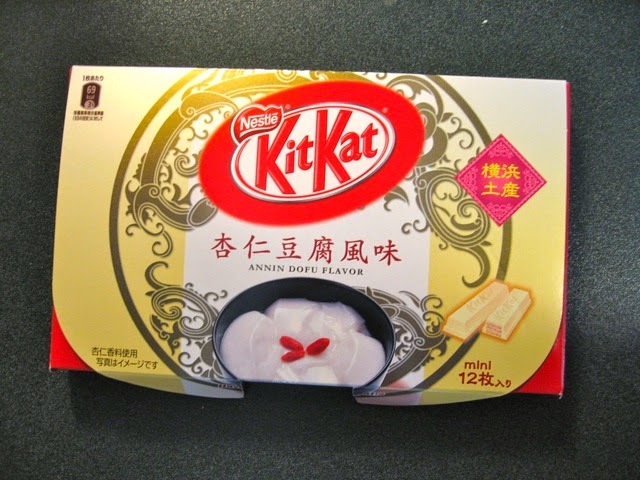 These special Kit Kats typically come in three frequently-changing flavours, for example, "Special Cream Cheese" which is one of their current offerings. 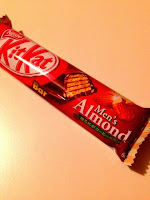 They sell out very quickly, so Kit Kat lovers better plan on getting there before lunch time. Unfortunately these handmade chocolates come with a "special" price tag as well, but it's not so unreasonable as to make them completely unaffordable. It's worthwhile to treat ourselves once in a while, right? 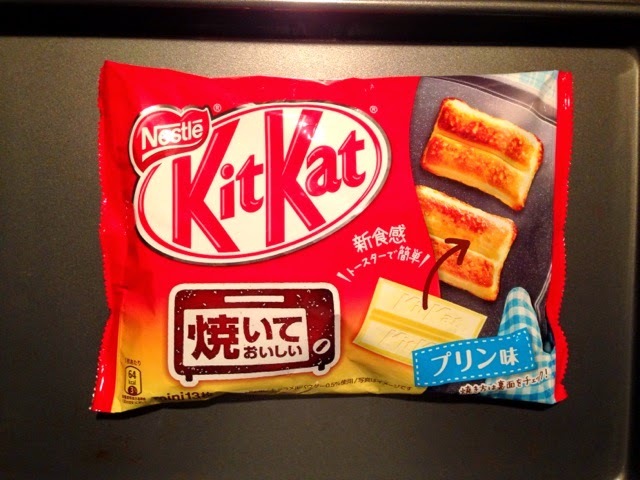 Word of warning: the Chocolatory sells only hand-made Kit Kats. The other "regular," seasonal varieties are not available there, so it might not be a first choice of locations for buying gifts for friends and family. Photo of the Day: Japanese Deadhead! Snack Time: Green Tea Latte Oreos!